Having been wanting to try C’s restaurant in Pampanga, who’s known for their Panizza, we celebrated my birthday at My Kitchen. My Kitchen is also the brainchild of Chef Chris Locher, the same person in charge of C’s restaurant. We didn’t have to travel all the way to Pampanga just to try it out. Rather, My Kitchen is just located in the ground floor of Oasis Park Hotel, the old hotel across Paco Park. The place is OLD. It reminded me of the a dilapidated hotel from the outside. Inside though, they’ve started renovating. We were given a private area inside the pub. Good thing as we brought Warren. Chef Chris was in contact with hubby all through out. He welcomed us to his restaurant and was discussing the food and his business. 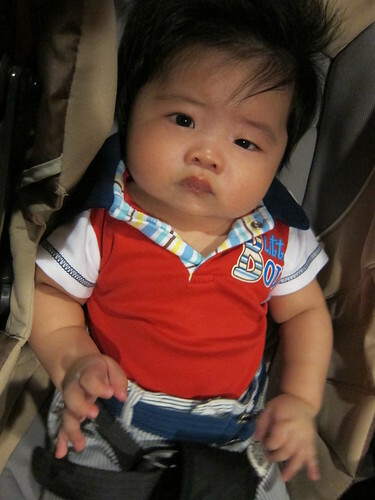 While waiting for my mom to arrive (who got lost! 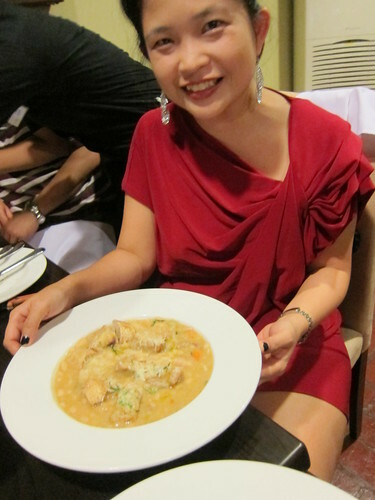 ), we started dinner with orders of Tomato soup (PHP180.00), Pumpkin soup (PHP180.00) and Ribolitta (PHP230.00). I found the Ribolitta to be interesting. 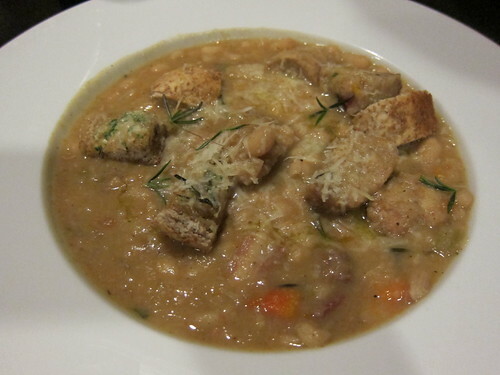 Its a Tuscan white bean stew with ham, vegetables, bread and parmesan cheese. The soups were good enough to be split into two. 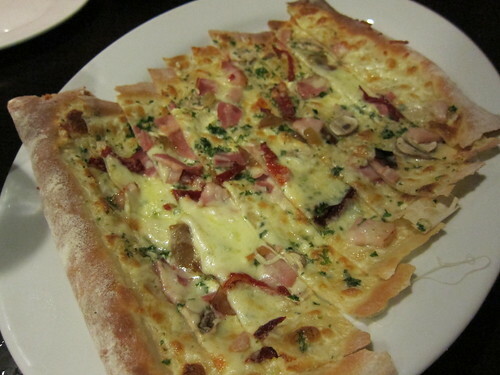 We went to My Kitchen because we wanted to try their Panizza and Panizza we ordered. We ordered 4 to try them out. 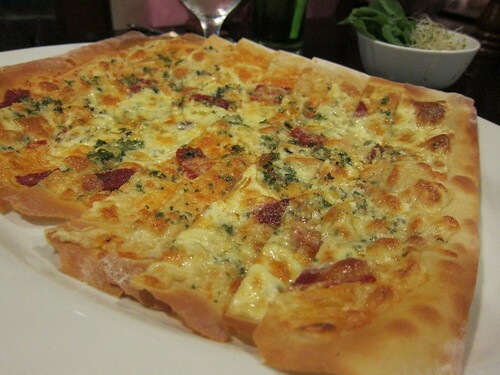 Panizzas are very thin layered pizzas with toppings on top. Top them with Aragula or Alfalfa and roll them. The Panizzas were very thin. A slice is good enough for 3 – 4 bites. The ones we tried were really good. I liked this better than Uncle Cheffy’s (there’s a huge price difference though. So Uncle Cheffy’s still has my vote for value for money). My brother who has been to C’s said that C’s is still better as he preferred the dough to be slightly charred. Named after the wife of Chef Chris, this has got to be really good. Kristina is made up of bacon, ham, caramelized onions, sun dried tomatoes and mushrooms. The kids just couldn’t get enough of this. 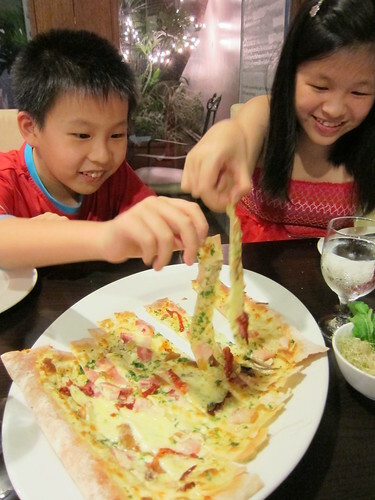 They quickly gobbled up the whole Panizza. Topped with US Scallops flakes, shrimps, sun dried tomatoes and chili flakes. I liked this best amongst the 4. It had the right kick and amount of shrimp servings. 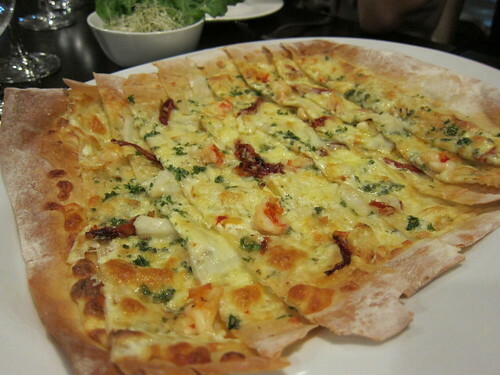 This is a panizza topped with spicy chorizo, anchovies, thyme and peccorino cheese. This one is likewise good. We initially ordered 1 of each of the above but since they got eaten so fast before my mom arrived, we decided to order 1 more Kristine. 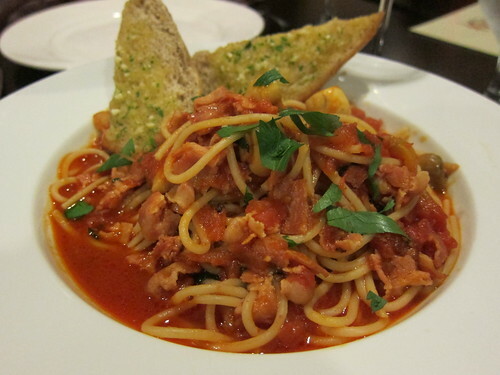 For entrees, we ordered 2 orders each of the Spaghetti con Fruitti de Mare and Lamb Shanks. 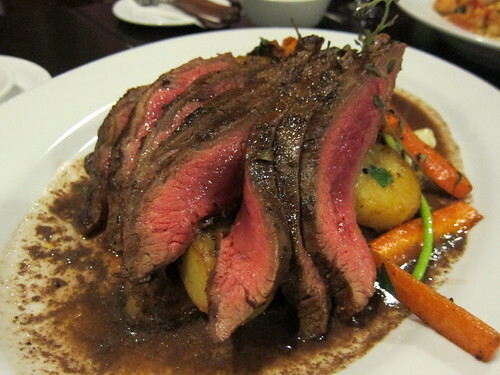 We also ordered 1 Spaghetti Putanesca, 3 orders of the Risotto and an order of their Family styled Bistecca. Loved the huge shrimps that came with it! Look at those amazing prawns. Aside from these prawns, it also had salmon and snapper with it. 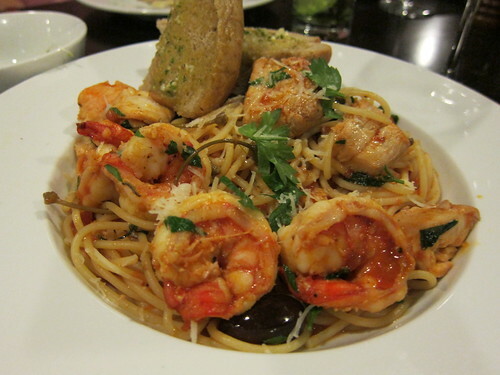 Since they were out of mussels, they just added prawns onto our spaghetti. Specially made by Chef Chris for us. This one is a winner! 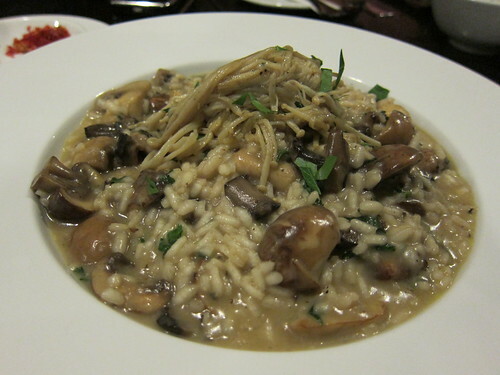 I love mushrooms and to put all 4 together on a perfectly cooked risotto is a definite diet killer. 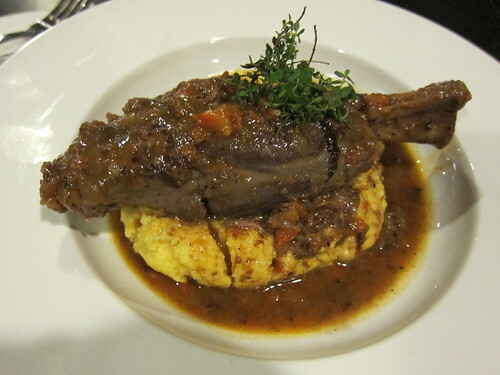 The lamb shanks was tender and gamey. I liked it though. It had an after taste though and my mom didn’t like it. I liked the parmesan polenta it was put on top off. Others loved the polenta also. We had this Bistecca split into 2. 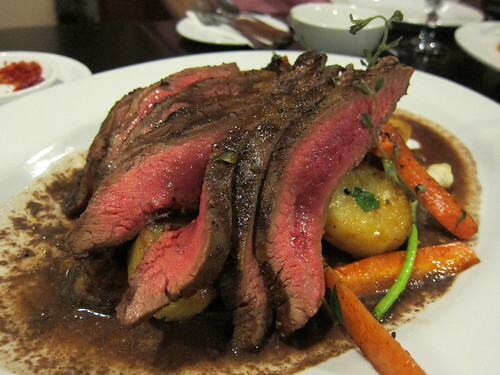 Perfectly marinaded with Rosemary garlic and topped on a bed of baked potato slices, carrots, and pumpkins, the US prime angus beef is tender and juicy. We had it cooked medium and it was pink on the inside and charred on the outside. I had mine redone since I didn’t want my beef that pink. It came out still very juicy and tender. 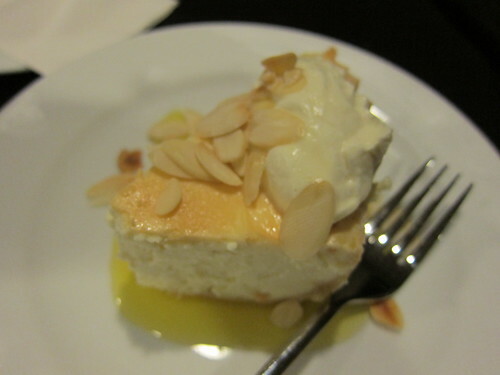 Of course, dinner should not end without trying out their dolce. 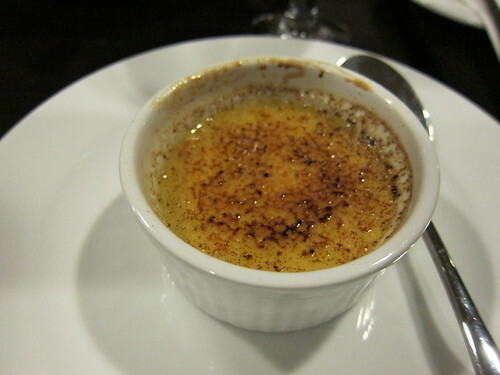 We had their Lemon Cheesecake, Tiramisu and their Creme Brulee. Desserts do not seem to be their specialty. 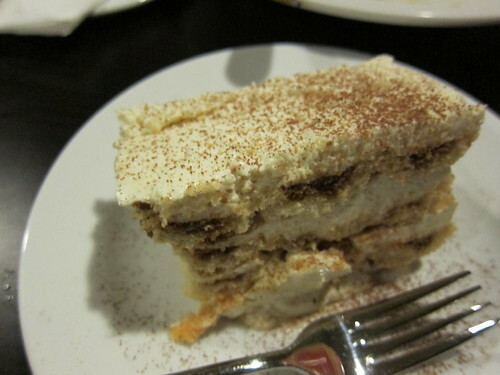 I liked the lemon cheesecake but the Tiramisu and Creme Brulee aren’t too good. Just knew it now that Chef Chris has a new kitchen at manila. Will definitely try that. 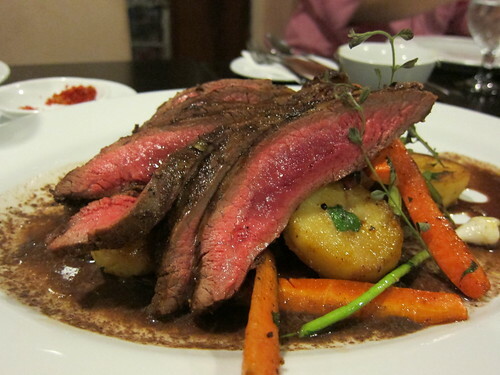 Love his C’s at Pampanga but it just too far from Manila….Thanks Liam for your blogs!